SPD/Mountain Bike Leg Length Shims (LL Shims) are used to compensate for leg length discrepancies with SPD cleats. SPD/Mountain Bike Leg Length Shims (LL Shims) are used to compensate for leg length discrepancies with SPD cleats. Our 3 mm LL Shim is made of high-density plastic to conform to the curve of the sole of the shoe. 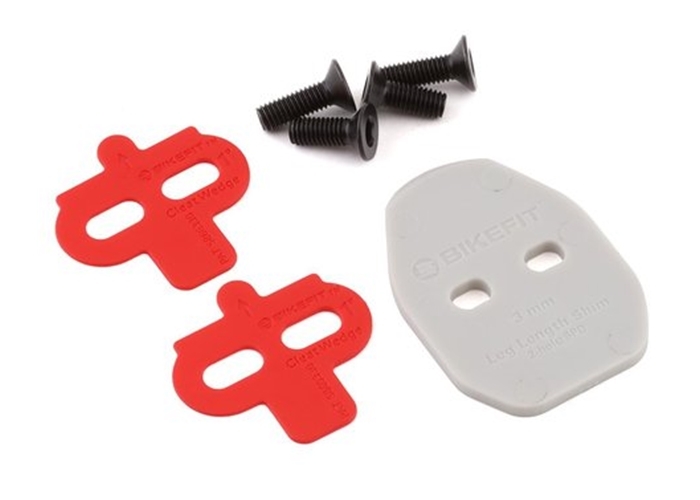 Package includes one (1) SPD/Mountain Bike Leg Length Shim, two (2) 14 mm, two (2) 16 mm screws and two (2) SPD Cleat Wedges (which can be "stacked" to create an additional 1 mm of height). The Installation instruction sheet can be downloaded below. One (1) SPD LL Shim is the maximum recommended per shoe.